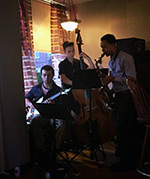 The HaNG Trio is a group of young musicians featuring Mike Hugo on guitar, Ron Gardner on Bass and Joshua Nelson on saxophone. They began as classmates at the SCCC School of Music and have been playing together throughout the Capital District ever since. Their music includes originals and jazz standards but as a group they venture into different avenues of music.